some useful sources of patient support. 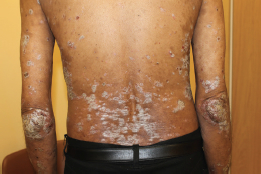 streptococcal infection (strongly associated with guttate psoriasis). The NICE clinical knowledge summary on psoriasis (see cks.nice.org.uk/psoriasis#!diagnosissub) provides a useful guide to the different types of psoriasis and how these may present. acute unstable psoriasis (urgent referral) and erythrodermic or rarely generalised pustular psoriasis (emergency referral). In its first clinical guideline on the assessment and management of psoriasis (NICE CG153, published in October 2012; see www.nice.org.uk/CG153), 1 NICE advises GPs and other healthcare professionals to assess the impact that psoriasis has on the physical, psychological, and social wellbeing of their patients, in addition to checking for the presence of psoriatic arthropathy. Doctors are recommended to conduct these assessments when they first see their patients, before they refer patients to specialists, and when monitoring how patients are responding to treatments. This is difficult to achieve in the 10 minutes currently allocated to each patient consultation. 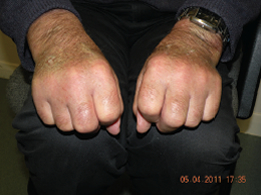 Most cases of psoriasis are mild and can be treated in general practice either by the GP or GPwSI. In our locality, experienced GPwSIs play a major role in triaging and seeing patients and are involved in the education of GPs and trainees. Unfortunately, there is no cure for psoriasis, but there are effective suppressive treatments aimed at inducing remission or controlling symptoms.4 Watchful waiting or no active treatment may be appropriate for patients with mild, long-standing disease and who have accepted their condition. Management of psoriasis in primary care is variable—diagnosis is often delayed, with a lot of patients being treated as having eczema. Education is crucial for improving diagnosis; the author’s hospital and community GPwSIs play a major role in dermatology training with the support of local consultants, who conduct mentoring clinics with the GPwSIs and arrange educational evenings for the GPs. The British Association of Dermatologists (BAD) and the Primary Care Dermatology Society (PCDS) guideline on the management of psoriasis recommends that patients are given both verbal and written information on treatment options.4 Likewise, NICE CG153 recommends that support and information should be tailored to suit individuals so that they confidently understand their diagnosis and treatment options.1 For some useful support groups, see Box 1. The clinician and patient should make a joint decision about the various therapeutic options, paying particular attention to the effect of psoriasis on quality of life and the benefits and risks of treatment.4 Educating the patient about their condition is a crucial part of management. The initial decision revolves around whether to employ topical therapy, systemic therapy, or both. People with psoriasis should be offered topical therapy as first-line treatment. Second-line therapy (i.e. phototherapy and systemic non-biologic agents) or third-line treatments (biologic therapy) may be offered at the same time as topical therapy if the latter is unlikely to provide adequate control.1 Recommended treatment order for the different types of psoriasis is summarised in the ‘management’ section of the NICE clinical knowledge summary for psoriasis (see cks.nice.org.uk/psoriasis#!management).3 A brief description of the different types of treatments is given below. Vitamin D analogues (calcipotriol, calcitriol, and tacalcitol) can be used for most types of psoriasis and are the first choice for maintenance treatment. They are cosmetically acceptable to the patient but can take up to 6–8 weeks to work. They can also irritate the skin (particularly calcipotriol), especially on the face and flexural area.1 Systemic adverse effects are rare and include hypercalcaemia and parathyroid hormone suppression. The maximum recommended dosage should not be exceeded.8 Neither calcitriol nor tacalcitol is licensed for used in children aged under 12 years. The use of vitamin D analogues in pregnancy and breastfeeding is best avoided if possible. very potent (e.g. clobetasol propionate, diflucortolone valerate). Only mild to moderate topical steroids should be used on the face and flexural areas, and for children.4 For very thick plaques, or on certain areas like the scalp, palms, and soles, a stronger topical steroid is needed. Tar-based preparations are a therapeutic option particularly suited to the treatment of scalp psoriasis;4 however, they have an unpleasant odour and can stain clothes. The choice of tar preparation should take into account the location of the affected skin, previous response to other treatments, and the patient’s preference. Tar products can be used alone or in combination with hydrocortisone, salicylic acid, dithranol, or sulphur. Dithranol is generally only used for plaque psoriasis and in patients who have psoriasis that is resistant to other topical treatments; however, the use of these preparations requires strong motivation on the part of the patient due to staining and skin irritation. Generally used as a short-contact treatment (30–60 minutes), dithranol comes in concentrations from 0.1%–3% and can be very effective in a motivated patient.3 One effective treatment is Lassar’s paste—dithranol with salicylic acid and zinc oxide—which is applied to the plaque, covered by stockinette, and left on for 24 hours. Tazarotene gel (0.05%–0.1%) is a treatment option for mild to moderate plaque psoriasis. This therapy is teratogenic and should not be used in pregnant women, women who are planning a pregnancy, those who are breastfeeding, and patients under the age of 18 years.6 Tazarotene can cause irritation, so patients need to avoid intense sunlight and to wash their hands after use. UVB: broadband UVB with a wavelength of 290–320 nm; or narrowband UVB (NB-UVB) of 311–313 nm, which is now considered more appropriate. Ultraviolet treatments are usually given 2 to 5 times a week (2 to 3 times a week for narrowband UVB).1 The main risk of phototherapy is the development of non-melanoma skin cancers.10 Localised phototherapy (e.g. excimer laser) can also be useful,9 but may cause skin pigmentation. Biologic agents do have a cost impact and their side-effects are not well known. It is important to ensure that all patients are registered with the BAD Biologic Interventions Register, which will assess safety issues in the relevant population. Patients with psoriasis are at increased risk of coronary artery disease, inflammatory bowel disease (especially Crohn’s disease), diabetes, hypertension, depression, and lymphoma.22 It is important to screen for these diseases and to treat them; primary care is in an ideal position to maintain a low threshold for screening patients with psoriasis for these conditions. Lifestyle changes should be promoted, including stopping smoking, taking exercise, moderating alcohol intake, and maintaining a body mass index between 19 and 24. Psoriasis is a systemic disease and is treated as such. As well as having the visible skin disease, patients are at risk of psychological and physical co-morbidities and side-effects from drug treatments; they also bear the social impact of the disease. Primary care teams have a pivotal role in managing the condition. Early diagnosis and targeted individualised treatment is crucial and can be achieved with help of community GPwSI and secondary care clinicians. Meier M, Sheth P. Clinical spectrum and severity of psoriasis. Current Problems in Dermatol 2009; 38: 1–20. NHS Clinical Knowledge Summaries website. Psoriasis. www.cks.nhs.uk/psoriasis/management/scenario_diagnosis/diagnosis/pustular_psoriasis#-406348 (accessed 6 August 2014). British Association of Dermatologists, Primary Care Dermatology Society. Recommendations for the initial management of psoriasis. In: Guidelines—summarising clinical guidelines for primary care. 52nd ed. Berkhamsted: MGP Ltd, February 2014: 401–403. Smith C, Anstey A, Barker J et al. British Association of Dermatologists’ guidelines for biologic interventions for psoriasis 2009. Br J Dermatol 2009; 161 (5): 987–1019. British Association of Dermatologists website. Patient information leaflets (PILs). www.bad.org.uk/for-the-public/patient-information-leaflets/psoriasis (accessed 11 August 2014). Mason J, Mason A, Cork M. Topical preparations for the treatment of psoriasis: a systematic review. Br J Dermatol 2002; 146 (3): 351–364. Patient.co.uk website. Chronic plaque psoriasis. Topical therapy: vitamin D analogues. www.patient.co.uk/doctor/chronic-plaque-psoriasis (accessed 11 August 2014). Feldman S. Treatment of psoriasis. UpToDate website. Dellavalle R and Callis Duffin K (Eds). 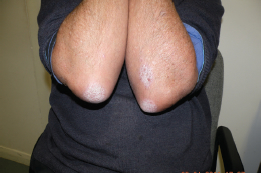 www.uptodate.com/contents/treatment-of-psoriasis (accessed 6 August 2014). British Association of Dermatologists website. Phototherapy. www.bad.org.uk/for-the-public/patient-information-leaflets/phototherapy (accessed 11 August 2014). British Photodermatology Group. British Photodermatology Group guidelines for PUVA. Br J Dermatol 1994; 130: 246–255. Finlay A. Current severe psoriasis and the rule of tens. Br J Dermatol 2005; 152 (5): 861–867. Griffiths C, Clark C, Chalmers R et al. A systematic review of treatments for severe psoriasis. Health Technol Assess 2000; 4 (40): 1–125. British Association of Dermatologists website. Methotrexate. www.bad.org.uk/for-the-public/patient-information-leaflets/methotrexate (accessed 11 August 2014). British Association of Dermatologists website. Acitretin. www.bad.org.uk/for-the-public/patient-information-leaflets/Acitretin (accessed 11 August 2014).